A priest has been banned from speaking at a Catholic conference in Australia because he is a supporter of equal marriage. Father Frank Brennan, a well-known Australian Jesuit priest and writer, was invited to speak at theCatholicCare Tasmania conference in February. 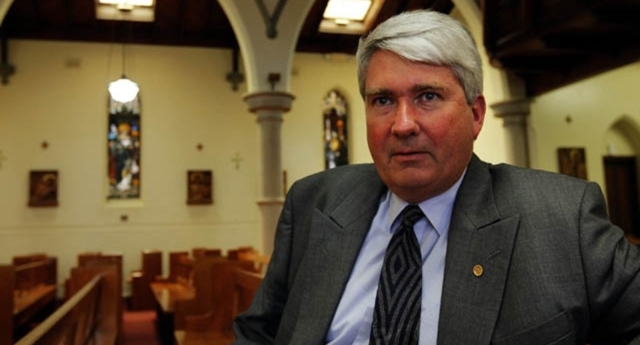 Tasmanian Gay and Lesbian Rights Group spokesperson Rodney Croome said: “During the marriage equality debate Archbishop Porteous regularly claimed that his free speech was being stifled and that marriage equality should be discussed freely. “But now he openly admits to silencing a well-respected priest, Fr Frank Brennan, at a conference in Hobart seemingly because Fr Brennan supports marriage equality. “Archbishop Porteous only cares about free speech when he is the one talking. “From now on it will be impossible to take anything Archbishop Porteous says about free speech seriously. It is not the first time a pro-LGBT speaker is alleged to have been outlawed from Catholic events. The Vatican cut ties with a Catholic International Women’s Day event this year because one of the speakers is a lesbian. The annual Voices of Faith conference, which features Catholic women from across the world, is traditionally held at the Vatican on International Women’s Day. However, this year’s event was spurned by Catholic officials, who took exception to the list of speakers – which included Ugandan lesbian Catholic Ssenfuka Joanita Warry, as well as academic Tina Beattie, who has challenged the Church’s anti-LGBT rhetoric. Pope Francis declined to attend the meeting, and refused to hold a Mass for those attending.